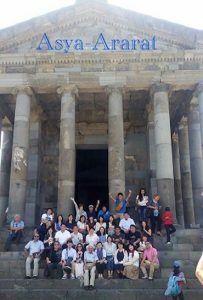 The Temple of Garni is a classical Hellenistic temple in Garni, Armenia. 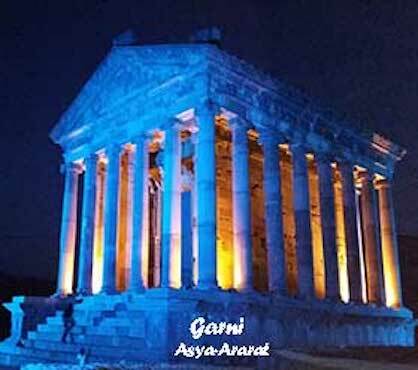 Reconstructed in the 1970s, it is the only known Greco-Roman colonnaded temple in Armenia. 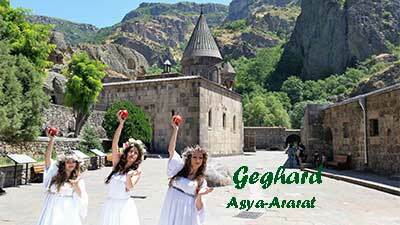 It is perhaps the best-known structure and symbol of pre-Christian Armenia. 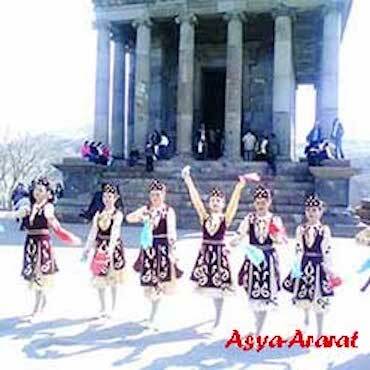 After the adoption of Christianity, all the pagan temples in Armenia were demolished except Garni. 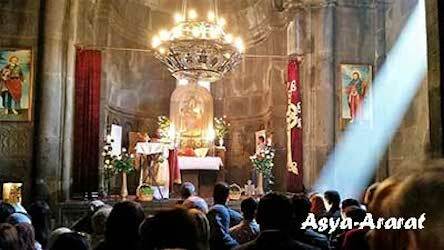 The reason how the temple could survive till nowadays is that the sister of the King TrdatIII, Kosrovdukht, had turned the place into her summer residence. The huge earthquake destroyed the defensive walls of the castle and the temple in 1679. The construction started in 1949. The temple was dedicated to Mythra, a deity popular in the Near East which became the patron goddess of the Roman Empire in the period before Christianity. Geghard is a medieval monastery in the Kotayk province of Armenia, being partially carved out of the adjacent mountain, surrounded by cliffs. The site of the monastery has been known from pre-Christian times, when people worshiped at springs at the site, especially the one inside one of the churches craved into the rock. As a monastic complex it came forward in the beginning of the 4th century founded by Gregory the Illuminator that was known as “Ayrivank” or “Monastery of Cave.” At its height in the 13th century, Geghard monastery benefited from patronage by princely families and was a pilgrimage site, not least for its reliquaries of the Holy Lance, the spear used by a Roman soldier to pierce the crucified Christ. 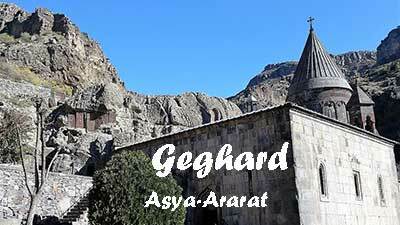 This reliquary gave the monastery its current name Geghardavank (Monastery of the Spear). Another relic was a wooden fragment said to have been a piece of Noah’s Ark.